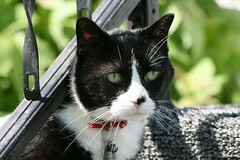 Felix was getting ready to go back inside, hence his elevated state of alertness. I should really try to be more alert (short of Beth's periodic reminder of how long it's been since my last post) about posting here, but things have been terribly busy, much to the dismay of the flocking audience here. For starters, today is our 6th anniversary. It doesn't really seem all that possible when I think about it, and I suppose that's a good thing. :) We've not done anything special yet, but it fell on a Sunday and so we'll have to figure something out for later on. Ma and Dad came up for the day, and that was cool. I've spent the last month or so really working on the basement (mostly on weekends when I have a little more time). As of tonight (or more appropriately Saturday evening), roughly three-quarters of the exterior basement walls have been painted (on the inside). I have a second coat to apply on one section before it's finished (and officially three-quarters complete), but that's just roller work and should go quickly. Things have been moving along in other ways. I've been keeping busy with a few side projects that have seemingly rotating deadlines or pressure spots. So that's really what's been keeping me busy in the evenings after my daily routine of hanging around with Kirstin and taking pictures. I started out writing this (or thinking about it over the last few days) with all sorts of good ideas about stuff to ramble about, but I'm not recalling them off hand, so I'll have to leave this post at that and call it good. For now. "Against stupidity, the gods themselves contend in vain." Frank Oz and I share birthdays (Go Fozzie Bear)! Mike Myers and I share birthdays (Party On, Wayne)!